Get Me a Fender Jazz Bass!! Technically I’m a shithouse bass player! My fingers are all jumbled up and all over the place. I think ever even practiced scales on bass until about a year ago!!! I snobbed Fender. 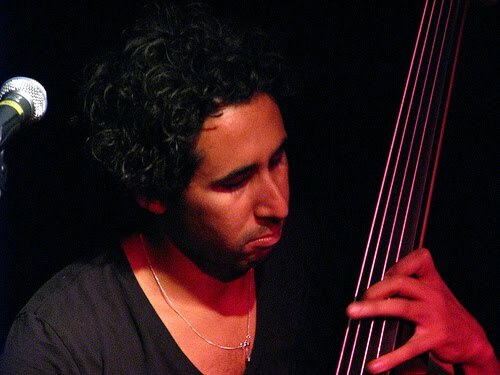 I dunno much about the world’s renowned soloist bassists … I can’t even hold a pick properly!! I have done everything in bass totally arse about! I think it was in 2007 around when we started Stellas Kitchen, I saw Diesel at the Leopold Hotel and I was watching bass player Richie Vez play. To me he was everything I wanted to be in Stellas Kitchen and as a bass player. What he was playing was amazing.. subtle at times – his technique and his singing was great too. Everything he did was in context of the band and the songs. I’d rather watch a good bassist play as a component in sync with his/her band and the song, over some mad soloist bassist any day! This is why I’m more into bassists like Ritchie, Chris Wolsteholme, Flea and Pino Palladino. necks are pretty reasonable and the tuners are not bad too. Of all my basses this one holds its tuning the best! Now it is a few years old the body and neck seem to have settled nicely. The neck is straight as anything and I’ve got the action set perfect for me. But.. the pickups sound basically dead compared to a standard Jazz or American Fender Jazz. Once the gloss wears off your new strings the tone is cardboard box wooden like. In saying all that, when I first got this bass and a glimpse into the Fender tone possibilities I was hooked.So, its only taken me 20 years! well not that long.. but I’ve finally got me a 2009 American Fender Jazz 5!! If only I had known better and not dicked around for all these years and got one of these babies from the start!! The sound of this bass is on other level compared to my other Jazz basses. Growling lively Fender tone is what you get when you just plug it in. From the glossy headstock finish to the string thru body bridge they are really in a different class to Fender’s cheaper options. I went for the Olympic white with shell pick guard. The USA basses are all a bit lighter. I don’t know how much actual weight difference the thinner paint finish, and lighter tuners really make, but you can feel the difference for sure. The Jazz necks are only slightly thinner at the nut – about 3mm but I just find them much nicer to play than the P-Bass. 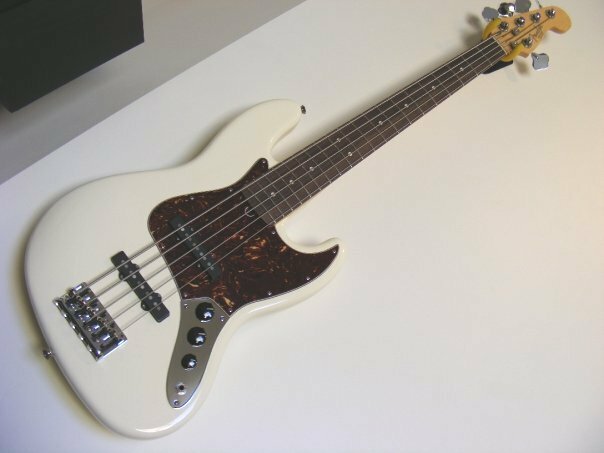 I spose I’ll eventually get one.. . (I’m that addicted now to trolling ebay for basses). I just find the P-Bass neck to feel like its almost got square sides compared to the Jazz neck. The body is smaller and lighter and just to look at they aren’t as shapely too I reckon. Maybe a P-Bass body with a Jazz neck might be the answer! Its not an uncommon mod which you can even buy from Fender. The Duff McKagan (Guns & Roses) Fender artist bass currently has this combination and many have hot-rodded this mod themselves. I might give it a go myself one day. It took a bit of massaging to get my Mexi 4 string Jazz set up how I like it. The American Jazz was pretty much right straight from the box.